Soldering is a deeply ritualised activity. Choosing the correct temperature, heating the iron, what solder do you use, lead or lead-free? What stand, flux or brand of iron do you choose? For many years I used an Antex XS25 iron. This powerhouse of an iron gave me 25W of power and a choice of tips – expensive tips – which could tackle any job. To this day this iron is in my rotation for large jobs. For smaller jobs I have a cheap USB (yes, 5V USB) iron that is neat and tidy, looks awful but gets the job done. But the problem with both of these irons is that they operate at one single temperature, around 300C. While this temperature may suit the speed at which I solder, it does not always suit the components being soldered, so what I needed was a temperature controlled soldering station. The problem with that solution? They are quite cumbersome and I only have a small workstation. So looking around the Internet I came across the TS100, a temperature controlled soldering iron that does not require the bulky station. Order placed and delivered to my door for around £40. The TS100 is remarkably small, measuring 16.5cm from tip to end, 1.5cm tall and 1.2cm wide. 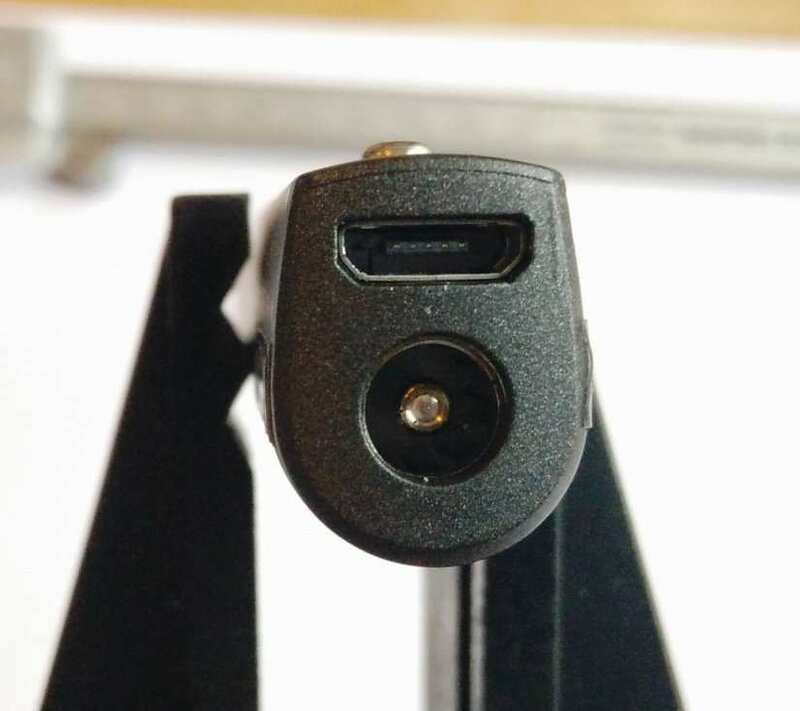 The TS100 has just two buttons to control the soldering iron, for output, there is a slim OLED screen that is used to display the temperature of the iron, etc. At the rear of the TS100 we have two ports, a DC barrel jack (DC5525), and a micro USB port used to upgrade the TS100, more on that later. To power the TS100 a DC5525 barrel jack DC power supply is required and this needs to be between 12V and 24V to heat the tip. Heating up times differ depending on the power supply, with the seller advising that a 12V supply will take around 40 seconds to reach around 300C, still much quicker than my Antex XS25. I used a 19V 2.1A supply (roughly 40W) and this heated the TS100 to 300C in 15-20 seconds. Power supplies can take the shape of any suitably rated supply, as long as there is a DC5525 jack on the end, all is good! 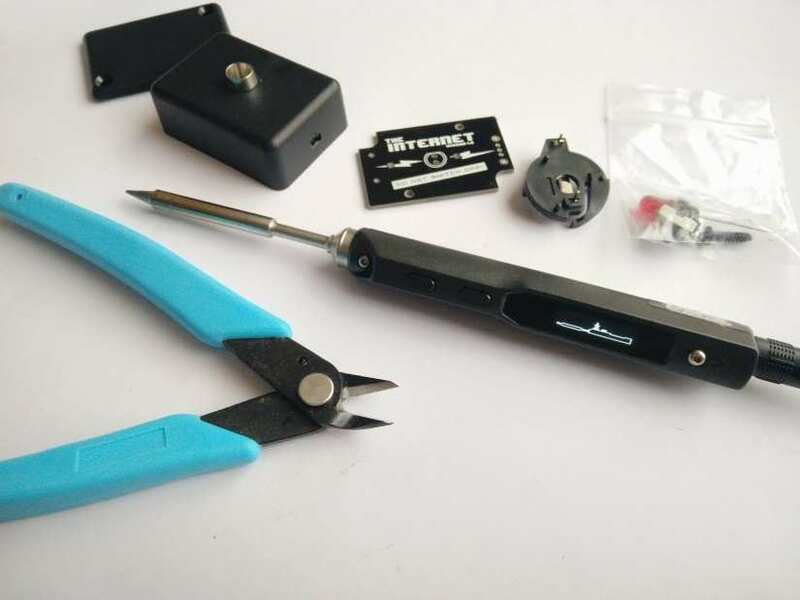 In fact, some aspiring makers have used LiPo batteries via a suitable controller and XT-90 connector to power a TS100 in the field! Remarkable! When powering up the TS100 we see an animated graphic on the OLED advising us to press the button nearest the tip. This will heat the iron up to a default temperature, which can be controlled by pressing the buttons on the iron. 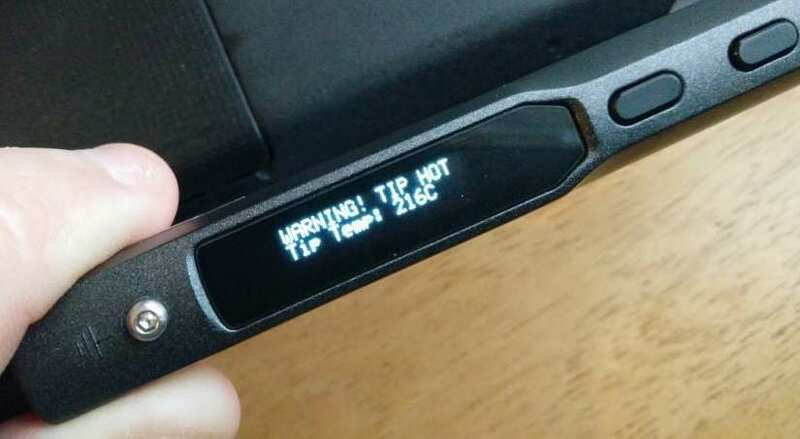 The iron will heat up and be ready for use and the current temperature will display on the OLED, just in case you forget! The TS100 ships with default firmware. Yes, you read that right, this iron has firmware that can be used to flash the STM32 microcontroller at the heart of the soldering iron. The basic firmware gets the job done, but thanks to an open source community of hackers, the TS100 has been given a much better firmware which includes options to control power source (LiPo cells or DC), sleep temperature and timer, shutdown timer just in case we leave the iron on! There are even options to control motion sensitivity, to detect when the unit is being used. Calibration of the soldering iron is also possible, to ensure that your temperatures are correct. So, how easy is it to flash new firmware on to the TS100? Well, it is incredibly easy, again thanks to the passionate community that supports it! I popped over to https://github.com/Ralim/ts100 and followed the instructions to copy a .hex file to the TS100 by plugging it in via a micro USB port, while holding the button nearest the tip. This mounted the TS100 as if it were a USB flash drive, then I copied the .hex and I was up and running in minutes. A tip for Linux users, look in the Flashing folder for a shell script that handles flashing the file, It works with Fedora and Ubuntu. The most important thing about any soldering iron is how it solders and the TS100 handles jobs both large and small with ease. The included tip is approximately 1.5mm at the thinnest point giving us an element of precision but still with plenty of thermal capacity for larger joints. Soldering with lead solder I built a kit to test the TS100 and I am happy to report that it handled the small solder joints with ease, larger joints heated up in a timely manner and provided a very consistent finish. The TS100 is a great soldering iron. It provides a solid soldering experience, and the temperature control provides an extra level of assurance when working with sensitive equipment. The stock firmware is usable and it provides every feature that you may need, but the community created firmware is much better and the vast number of extra features that it brings will make your soldering projects much more streamlined. Not supplied with a power supply. Makes a faint buzzing noise. Extra tips are around £8 each. If you need a new soldering iron then this should be top of your list. It can handle jobs both large and small. Just remember to budget for a 12V-24V DC5525 power supply, as it is not included with the TS100. Enjoy soldering with this great iron!